This group is for anyone who needs support or ideas. Whether you’re dealing with toxic people or you just need to set a difficult boundary, we’re here for you. Often just sharing experiences is enough, because we learn so much from the insights and observations of others. Setting boundaries can be tough. Being in a group of people facing similar challenges can encourage us to set those boundaries. Setting healthy boundaries is a skill like any other. Being part of a group means helping each other to develop that skill. Schedule a free 20-minute chat with me via FB Messenger to talk about any boundary challenges you may want help with. The group is the place I’ll share content from simple tips to more in-depth thoughts on setting smarter boundaries. You’ll be the first to hear about my new books and advance reader copies. This is where you can get access to any free or paid on-line group sessions. 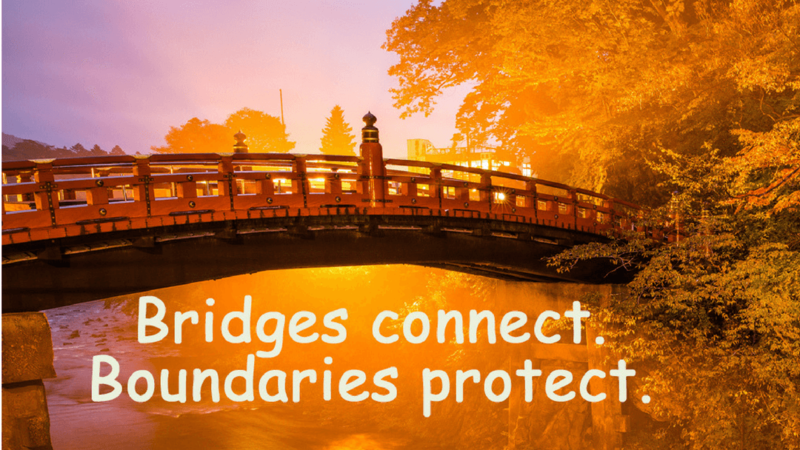 I look forward to welcoming you to Boundaries and Bridges! People-Pleasing: Are you turning your back on yourself?